This is a post rounding up three recent made-to-measure commissions that for different reasons, didn’t quite work out. As ever with the reviews and commentary, all three brands are aware of the issues, and we have already talked about what can be learned. In fact, all three are good examples of brands that take this constructive criticism very well: openly, honestly and positively. Saman and Dag have already made me a few things that have been extremely good. The checked jacket they made was probably the best made-to-measure tailoring I’ve ever had, and the two pieces of knitwear worked well too. Both have been covered before, at those links. These trousers, however, had issues from the start. Partly because the measurements didn’t come back quite right, so the fit was large. We adjusted them in the leg and seat, but at the next visit to London they needed taking in again. The third try produced a good fit. There was also an issue with the way Saman tends to make the pattern, which puts more fullness on the front of the leg. This works well for a lot of men, but not so much for me. It also means the pockets are harder to use, being further back on the hips. I think it was also a mistake to have a single pleat in such a pliable fabric, as it means the pleat has no hope of staying sharp. But I have to take some responsibility for that choice. In every other way, the trousers were great. Solid construction, nice style, and a Loro Piana ‘denim’ that looks nice and casual but doesn’t look like it’s pretending to be a jean. The trousers I now have are perfectly wearable, and they will be worn. But next time I’d go for a flat front and probably ask to not have that fullness at the front. 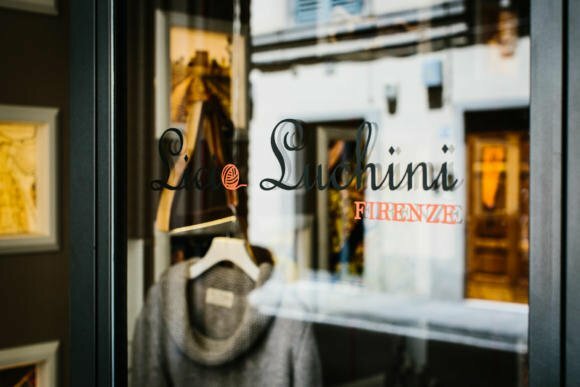 I reported on the small hand-knitting operation run by Matteo Luchini and his family last year in this article. I received the navy sweater I commissioned a couple of months later, and the make was wonderful. Just what you’d expect from hand knitting, and with that peacock pattern on the sleeve that was extremely subtle. However, the fit wasn’t great. It was a little narrow in the upper arm, perhaps a touch in the chest, and much too short. Fortunately, adding length to hand-knitting is fairly straightforward, so I sent it back and had the missing length added. The sweater I have now is the perfect length, but still not quite right elsewhere. I’ve talked to Matteo about this, and suggested it would be better to work from size blocks going forward, rather than just taking body measurements. So a customer can try on a 48 or a 50, and then request that the arms are a little longer, the body a little shorter and so on. That involves a lot less interpretation on the part of Matteo, and makes it more likely the customer will get what he is expecting. Matteo has decided to do this going forward, and I’m sure that will work better. I wish him and the family luck. 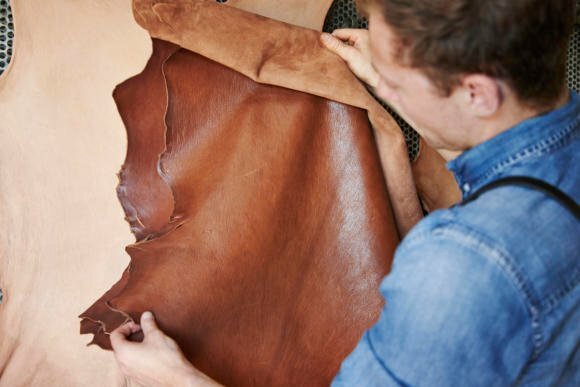 When I visited Jack Millington’s start-up goat tannery last year, he said he would like to see how it made up into a jacket, and offered to do so through Cromford Leather in Marylebone. We picked a fairly simple and classic design from Cromford - the De Niro - and went made up some leather especially (the colour pictured). I did a fitting in muslin with Cromford, which basically just required making the shoulders and chest a little bigger, and the waist a little slimmer. Then Pauline and the team made the jacket up. From a make point of view, it was perfect. And Pauline also did some great dying of the skin around seams and edges, to give it a subtle vintage look. But unfortunately the leather had an issue where a scrape to the surface showed the light inner (corium) of the skin. Having taken the jacket back, Jack discovered that this was due to weaker liming in the early stages of the tanning. Jack uses a light hand finish on this leather, which means it’s not dyed all the way through. This looks great, and normally wouldn’t be an issue, but this tanning problem made the surface weaker and allowed the core to show. We have been able to minimise the effect with some creams, and for Jack it’s a useful learning point, for what is still (like Licia Luchini) a young company. I think it's worth emphasising that experiences like these are a small minority of the bespoke or made-to-measure projects I undertake in any year. And, being custom-made products, there is always greater risk of things not turning out as expected. Indeed, a useful aspect of these posts might be that readers realise it happens to others too. Most importantly with my issues, they are ones that can be corrected, and the makers’ attitude means that they will be. 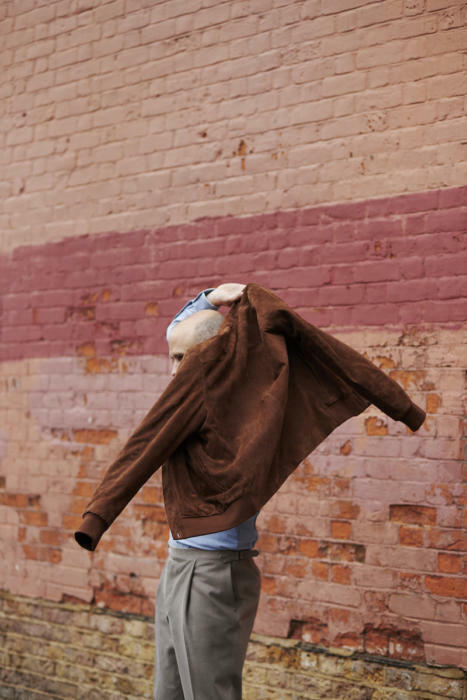 Photography of Saman Amel trousers and Billy Tannery leather: James Holborow. Photography of Licia Luchini: Jamie Ferguson. Apologies for the lack of photography on the other pieces. I'll take ones if and when there is a new version of the knitwear or jacket. Suede jacket shown top: Connolly. Want to learn about how Permanent Style is funded? Read 'Is this an advert?' here. You can follow the discussion on Saman Amel, Licia Luchini, Billy Tannery: Things that didn’t quite work by entering your email address in the box below. You will then receive an email every time a new comment is added. These will also contain a link to a page where you can stop the alerts, and remove all of your related data from the site. I think the Saman Amel trousers looks lovely, great color. Curious about your comment on the pleats, since it’s cotton, I wouldn’t have expected a pleat and crease to keep sharp for very long regardless. Was this a surprise for you or rather a suspicion you got confirmed? You’re right, cotton will generally not be as good at holding a crease as wool, for example. But the other aspects of the cloth – yarn, weave, finish – make a big difference. My Dalucore trousers, for example, I highlighted as being good because of their stiffness. These are a lot softer and looser (and therefore more casual) so the crease doesn’t really work. Shame the trousers didn’t quite turn out right. The fabric looks great. Honestly this fabric is fantastic. @Simon, do you know which Loro Piana swatch book this came from? I’m going to get myself a pair. Not sure if this is possible, however would you be able to advise how trousers should fit/balance to a person who has prominent seat, meaty thighs and legs on the shorter side comparing to torso? – If you are to have turn-ups, don’t make them too deep. A couple of inches will do. – In case you’re thinking of goign MTM, and, worse, ordering online, be very careful. There things like the volume of fabric around the crotch that are very hard to get right without trying the trousers on. And it is only a trained eye that can decide what kind of adjustment you need: whether to let out the leg at the crotch, which of the panels to move, how the panels meet at the fork, what the length along the crotch seam should be, where most of the length should be situated, whether it’s the front or the seat, etc. Your advice to “T” is very valuable and correct! Hmmm! The fit on those trousers looks a bit off! Are Pommela Napoli bespoke trousers consistent in terms of fit and finish? The Fox Cricket Flannel they made RTW we’re super comfortable when I tried them in your Pop up last year Simon. Yes, as mentioned in the text…they needed adjusting. Yes, Pommella have been consistent in fit and finish. It’s full bespoke though, so slightly different offering. It would look a lot better in you have English pleats rather than those shown here. 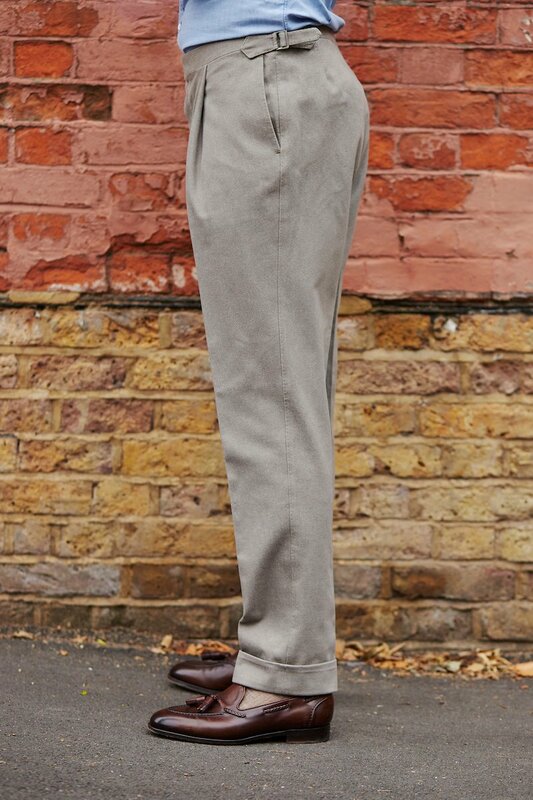 They would add to, rather than detract from, the look of the trouser. 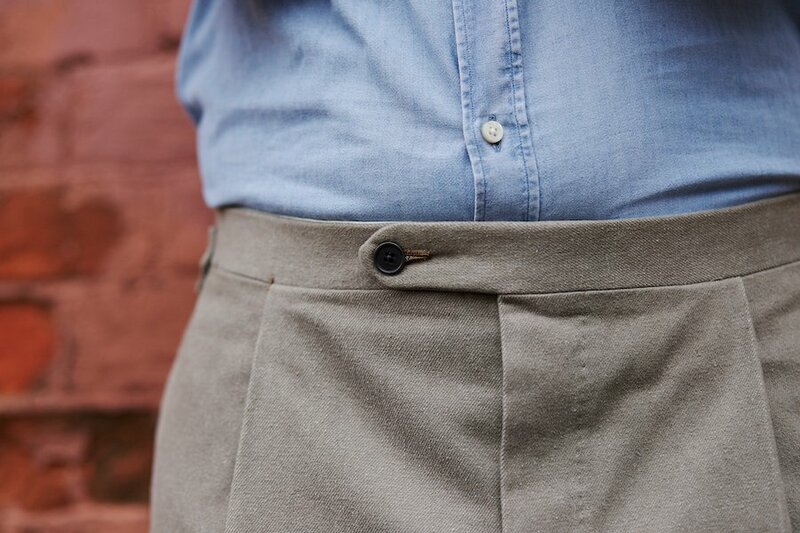 If by English pleats your contributor means forward, then I would agree it makes for a better look than a reverse. However, l think a pleat of any sort on this kind of trouser is wrong; a knife dart would be a more fitting option in my view. The trousers fabric is great indeed (do you have the bunch reference?). I remember you wrote side adjusters may not work well with thick fabrics. Is it not the case here? It’s the Loro Piana denim – I don’t think it’s available any more. See above for the cloth – it’s not available anymore unfortunately. Could you please recommend an alterations tailor, I have tried Graham Brown but they said they only work on the jackets that they made. What is the pricing like on these products? I’m especially curious about the trousers. Sometimes I wonder about the value proposition of really high-end made-to-measure. I’ve gotten very nice trousers from Luxire that fit me perfectly. (Trousers with VBC cloth typically cost around $200; Dugdale and Minnis Fresco are closer to $300). I could imagine spending an extra $100 or so for superior finishing, but once you get in the $800 range or so (as some premier MTM are), it just doesn’t make any sense. At that point, you might as well pay a little more and get full bespoke. But horses for courses, I suppose. The comparison is hard to make, and maybe even meaningless. High-end MTM, and even some high-end RTW for that matter, in my humble opinion, provide certain attributes that you’re never going to get from a pair of $400 trousers. The principles of economics forbid it as much as the ones of aerodynamics forbid you from flying without mechanical or other help. That being said, Luxire provides a great “value” market. But that’s just what it is. The fact that Ambrosi, Cerrato, Poemmella, as well as Attolini and Orazio and many more maintain thriving businesses, indicate that there is a certain “thing” (je ne sais quoi, if you will) people are eager to pay for even knowing that they could pay less elsewhere — even if that thing is a certain exclusivity (or the beautiful hardware that you get from Pommella that Luxire cannot offer at $500). Maybe there is an intangible thing working here that is hard to articulate but easy to feel. My test has always been this: all trousers feel and look great the first year you own them. But generally some trousers still feel that way 5 or 10 years later and others simply do not. Finally, I note that people weigh a multitude of factors when deciding on what to buy. Two of the most salient factors are price x wait-time. 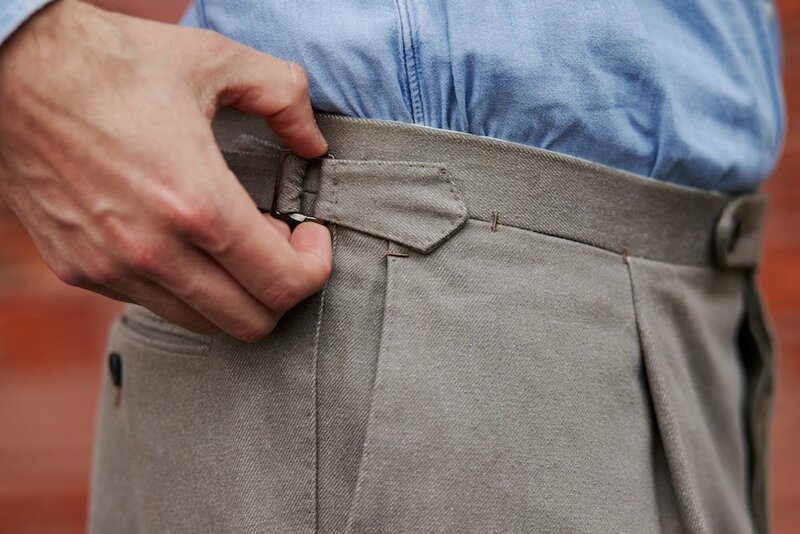 A good initial pair of bespoke trousers will take a good 9 months as well as a schedule-disrupting 3 or more fittings. I think that’s what drives MTM in many cases; you get to relinquish some fit for some time with your hobbies. It appears that the Saman Amel trousers have some nifty hand-work for a MTM item, notwithstanding your issues with them of course. Particularly with MTM, do you ever suspect that your trousers (or clothing in general for that matter) get paid a little more attention than what’s given to the clothing of others? And do you have a control method other than the vigilant analysis and comparison of your readership, for ensuring that you’re getting a representative product? Yes, there are some nice hand touches in there. In terms of a comparable service, yes I regularly talk to readers about their experiences – the pop-up shop is particularly useful for that, but many also email to volunteer information. For whatever reason though, I’ve really found that I’m treated differently. Not sure whether that should bother me or not. Thanks for the honesty in reporting Simon. It would have been good to see more images however, particularly to illustrate the issues that you highlight. I mention this as readers could then decide for themselves as to whether each of these would pose an acceptable risk (or not) in any commissioning process. Appreciate the critical honesty of this post. I too am curious about your concern re the pleats. I’ve never paid much attention to the sharpness of the pleats, assuming they vary naturally with the chosen fabric. Your post seems to suggest that multiple pleats may produce sharper lines than a single pleat. Is this the case and, if so, why? I was also very much looking forward to the final Luchini product and am sorry to hear that it wasn’t satisfactory. My position that bespoke knitwear isn’t worth the added cost remains. Would you (keeping in mind your own production of rtw knitwear) agree? That was a great post. With customised products, the margin of error is much higher, which also makes the satisfaction so much greater when things go right. With MTM, they are usually based off block patterns which are cut to standard and balanced body types, with mannequin-esque proportions. The amount of adjustments that can be made using these blocks are limited. To be fair to the makers, your form isn’t the easiest to work with, even when it comes to bespoke, so naturally with ‘true MTM’, it will be that much more challenging. I said ‘true MTM’ because I strongly doubt you get the same kind of MTM service/adjustments that regular ‘unknown’ clients get, due to your popularity. I assume the whole point with made to measure or bespoke, the tailor, shirtmaker, shoemaker etc take the items back as many times as needed until the item fits correctly? Yes Joel, with errors like those here they would take it back and correct it. I would just like to add that I have always had a very good experience with Saman Amel (been a customer since 2015). Their level of service and willingness to correct flaws (even if you’ve gained or lost weight) is much better than other MTM services I have tried throughout the years. I’ll back this up 100%. They’ve adjusted pieces several years old for me, and I would’ve been happy to pay for it, but they’ve never uttered a word about it. They’re really all about the long term relationship. To be clear, I don’t think this post says anything to oppose these views. The trousers will still be worn and any future commissions will most likely be made sans pleats (or in a dressier fabric) with more balanced front and back panels. If anything I’d say with MTM the “learning curve” between maker and customer may be greater than with bespoke, simply due to the limited possibility to change the garment once made.